I recently spent a paltry thirty dollars on an obsession, and it changed the way I cook. I bought a stainless steel hotel pan, a perforated pan, and a lid from Lit kitchen supply on Union Avenue in order to make my own homemade, makeshift vegetable smoking device. I figured, why let the omnivores have all the fun with their smoky bacon and BBQ contests? I wanted to start smoking, too. Dates are one of my favorite things to smoke. The sweetness of the date and the savoriness of the smoke play off of one another beautifully. 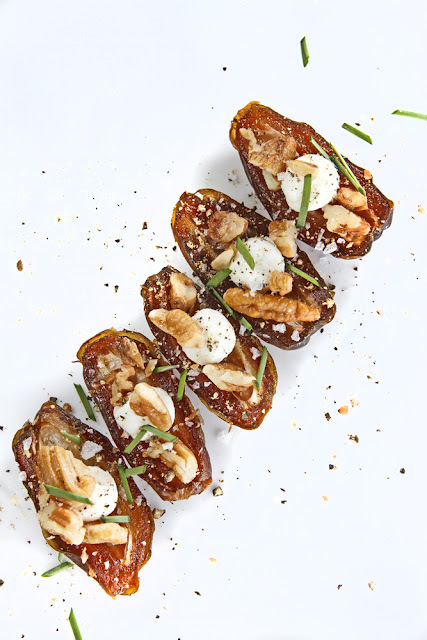 Add in a little soft goat cheese and chopped pecans to make one perfect little bite. Think of this as the veg version of bacon-wrapped dates. Put a tray of these babies out at your next party, and your guests won't believe their tastebuds. This is one hot date! Using a sharp pairing knife, split each date lengthwise much the same as you would an avocado. Remove the pit and discard it. Next, roll about 1/4 teaspoon of the goat cheese between your fingers to form a tiny ball and insert one goat cheese ball into the cavity of each date half. Add about 1/4 teaspoon of the chopped pecans to each half, garnish with salt, pepper, and chopped chives. Enjoy! You will need some special equipment for this. Many grill-top or stove-top smokers are available nowadays. You can find them online or at almost any specialty kitchen store like Viking and Willams-Sonoma. I made my own using a 9x12 stainless steel pan with a shallow, perforated basket and a tight-fitting lid. You could also use an old stock pot with a lid and an old footed colander that will fit down inside the pot. Just remember, the lid has to fit tightly to keep the smoke in, and anything you use has to be dedicated to smoking -- it will be completely ruined for any other purpose. The main thing is that the large pan has to be at least one inch deeper than the perforated pan so there's room for the wood chips. You'll also need an outdoor gas grill and some wood chips, which are available in most grocery stores -- especially during the summer months. The following instructions work for smoking any non-meltable foods like mushrooms, dates, grapes, sun-dried tomatoes, potatoes, sea salt, or tofu. Do not try this method with a cheese that will melt, because, well, it will melt. That said, this is a wonderful and simple way to impart a ton of flavor into some very unexpected things. 2. Drain chips and set them in the bottom of your smoker pan. Turn your grill on high. Caveat: I do not recommend doing this inside as it produces a ton of smoke. Place the smoker pan directly over the flame of your outdoor gas grill (the side burner works best for this) and leave it alone. After 8 minutes, you will notice a lot of smoke coming from the chips; this is a good thing! 3. Lay mushrooms, dates, tomatoes, garlic or anything else you want to taste smoky in a single layer in the smoker basket and place over the smoking wood chips. 4. Cover with a tight-fitting lid. Wait five minutes. It doesn't take long for vegetables and grit to soak up that smoke flavor. Remove whatever you just smoked from the basket and allow it all to cool. Keep items in an airtight container for up to a week. Sounds like an amazing combo. Love the idea of smoked dates.